Investigation against Russia’s top anti-corruption official completed - lawyer | Russian Legal Information Agency (RAPSI). MOSCOW, May 14 (RAPSI) – Pretrial investigation into the case against Denis Sugrobov, former head of the Interior Ministry’s Economic Security and Anti-Corruption Department who was charged with abuse of power, has been completed, his lawyer Eduard Isetsky told RAPSI on Thursday. Sugrobov will begin reading the case materials soon, Isetsky said. There are about 200 volumes in the case, 50 of which are confidential. Earlier, investigators brought 21 charges against Sugrobov. Presently, the defendant is in jail. His detention has been extended until August 14. According to investigators, Sugrobov and his deputy Boris Kolesnikov tried to provoke a Federal Security Service (FSB) officer by offering him $10,000 a month for his protection. Sugrobov was charged with organizing a criminal group, abuse of power and bribery last May. Kolesnikov was arrested in February 2014. In June, he jumped out of a window during questioning at the Investigative Committee in June. Later the Basmanny District Court said no evidence was found of assisted suicide. In late August, Moscow’s Basmanny District Court seized assets owned by Sugrobov and Kolesnikov, which have been reportedly estimated at over 300 million rubles (approximately $6 million). 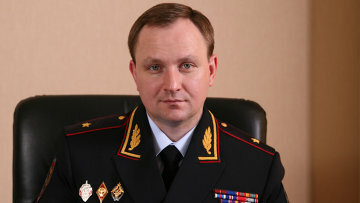 Sugrobov, 38, is one of the youngest police generals. Kolesnikov was 36 when he was promoted to general. 11:46 14/05/2015 Pretrial investigation into the case against Denis Sugrobov, former head of the Interior Ministry’s Economic Security and Anti-Corruption Department who was charged with abuse of power, has been completed.